Neutrons are powerful probes of the structure and dynamics of materials ranging from molecules inserted into membranes mimicking cell walls to protons migrating through fuel cells. The unique properties of neutrons (shown below) can be exploited by a variety of measurement techniques to provide information not available by other means. They are particularly well suited to investigate all forms of magnetic materials such as those used in computer memory storage and retrieval. Atomic motion, especially that of hydrogen, can be measured and monitored, like that of water during the setting of cement. Residual stresses such as those inside stamped steel automobile parts can be mapped. Neutron-based research covers a broad spectrum of disciplines, including engineering, biology, materials science, polymers, chemistry, and physics. The cold neutron guide hall at the NCNR: visible in the foreground is the sample environment staging area, with the Disk Chopper Spectrometer (DCS) immediately behind it. The new Very Small Angle Neutron Scattering (vSANS) instrument is being assembled to the right in front of the High Flux Backscattering (HFBS) instrument. To the left the mezzanine of the Neutron Physics research station is visible, as well as the SANS (NG7) guide and the Neutron Interferometry cave. The NCNR's neutron source provides the intense beams of neutrons required for these types of measurements. In addition to the thermal energy neutron beams from the heavy water or graphite moderators, the NCNR has a large area liquid hydrogen moderator, or cold source, that provides intense beams for experiments employing low energy neutrons. The NCNR supports important NIST research needs, but is also operated as a major national user facility with merit-based access made available to the entire U.S. technological community. Each year, over 1700 research participants from all areas of the country, from industry, academia, and government use the facility for measurements. Beam time for research to be published in the open literature is without cost to the user, but full operating costs are recovered for proprietary research. Access is gained mainly through a peer-reviewed, web-based proposal system with beam time allocated by a Beam Time Allocation Committee twice a year. (For more details please click here). The National Science Foundation and NIST co-fund the Center for High Resolution Neutron Scattering (CHRNS) that operates six of the world's most advanced instruments. Time on CHRNS instruments is made available through the proposal system. Some access to beam time for collaborative measurements with the NIST science staff can also be arranged on other instruments. 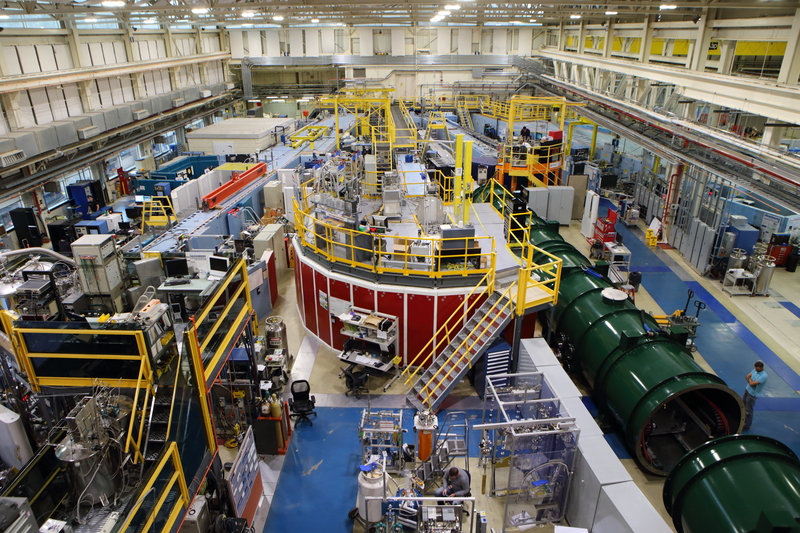 Neutrons at the NCNR reveal properties not available to other probes. They can behave like microscopic magnets, can diffract like waves, or set particles into motion as they recoil from them. Wavelengths range from 0.1 Å to 100 Å, allowing them to form observable ripple patterns from structures as small as atoms to as large as proteins. Energies of millelectronvolts, the same as that of motions of atoms in solids or liquids, waves in magnetic materials, or vibrations in molecules. Exchanges of energy between neutrons and matter as small as nanoelectronvolts and as large as tenths of electronvolts can be detected. Selectivity in scattering power varies from nucleus to nucleus almost randomly. Specific isotopes can stand out from other isotopes, even of the same kind of atom. Specific light atoms, difficult to observe with x-rays, are revealed by neutrons. Hydrogen, especially, can be distinguished from chemically equivalent deuterium. Magnetism makes the neutron sensitive to the magnetic spins of both nuclei and electrons, allowing the behavior of ordinary and exotic magnets to be detailed precisely. Neutrality of the uncharged neutrons allows them to penetrate deeply without destroying samples, and pass through walls controlling a sample's environment allowing measurements under extreme conditions. Properties ranging from the residual stresses in steel girders to the unfolding motions of proteins are amenable to measurement by neutrons. Capture characteristic radiation emanating from specific nuclei capturing incident neutrons can be used to identify and quantify minute amounts of material in pollutants or ancient pottery shards.